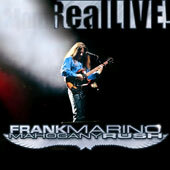 Frank Marino and Mahogany Rush - "Real Live"
What can I say? I have been a Frank Marino fan for over 20 years and he remains one of my all time favourite guitar players. Frank has not been very active the last many years but after a dedicated fan base pulled him away from his family life he decided in 2000 to start to play live again after a nearly 8 year break. This CD was recorded in his home town of Montreal in 2001 on the Eye of the Storm tour. I saw him at the Sweden Rock Festival 2000, his only European concert since 1984. Anyway, this fantastic double CD set, which includes a great long book describing a lot of details of this gig and an interview with Frank, makes this a hell of a package. As for the music, Frank has rarely sounded better, taking amazing long guitar excursions into the unknown and back. A lot of classics are here like "Voodoo Chile", "Red House", "Crossroads", as well as killer long jams of "Poppy", "Strange Universe" and "Rock and Roll Hall of Fame". I love the new stuff like "Avalon" and "He's Calling". On "He's Calling" Frank really has some great guitar sounds and a special feel in his playing on this track. The final track, "Try For Freedom" is simply amazing. If you like guitar playing you can't live without this CD. Please keep making music Frank. I need it. For more information you can visit the Just In Time Records web site at: http://www.justin-time.com.